The first thing that drew me into this read was the title. Somehow I sensed this book wasn’t about Never Never Land, Tinkerbelle, or never growing old. This book was about a murder. And let me just say…WOW. Peter Pan Must Die is tells the story of a perfect case–a wife accused of murdering her husband; overwhelming evidence; life sentence; a woman nicknamed the black window– a woman capable of committing a murder…only she didn’t do it. Detective Gurney sets out to find the true killer, in a murder case with twists, turns, and one that leaves the reader wondering…who is Peter Pan (and all of us thinking find him before he finds you!)? I have to confess though, the reason it took me so long to put up a review on this book was not because it was painfully boring to read. When I decided this book would be the one I MUST review I suddenly realized my only option was an e-book or in my case, a download onto my computer. I thought, “It will be no big deal”. But yes, yes it was! I never felt like grabbing my bulky laptop and curling up in bed and reading from the large screen with its’ blinding blue lights. In case you haven’t guessed I am a huge fan of hard copy books, books you can smell, books you can hold in your hand. I am not an e-book / kindle fan! 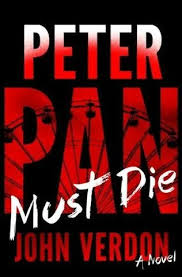 Final thoughts on Peter Pan Must Die—if you love suspense then you will enjoy reading this book. I was actually scared for the main character, thinking, “He’s gonna die, he’s gonna die!” The author really brought about a unique and terrifying antagonist…one that you won’t soon forget. « First page of my book!